Telemetry -- read tracking -- seems to be everywhere these days. Microsoft pushes it on Windows, and web and software companies use it as well. While there is certainly some benefit to it on a larger scale, as it may enable these companies to identify broader issues, it is undesirable from a user perspective. Part of that comes from the fact that companies fail to disclose what is being collected and how data is stored and handled once it leaves the user system. In the case of Nvidia, Telemetry gets installed alongside the driver package. While you may -- and should -- customize the installation of the Nvidia driver so that only the bits that you require are installed, there is no option to disable the Telemetry components from being installed. These do get installed even if you only install the graphics driver itself in the custom installation dialog. Most users who use PCs with Nvidia video cards probably don't even know that they are tracked by the software. The Nvidia telemetry service runs in the background on user log on, and additionally once a day. As is the case with these kind of tracking services, there is little information found on the data that it collects. Update: Click on this link for a sample data set. You can check the Windows Task Scheduler to list all third-party tasks that run on the system. To do so, tap on the Windows-key, type Task Scheduler, and select Task Scheduler from the list of results. Disabling the Nvidia Telemetry tasks has no ill-effect on the system. The video card works exactly as before and you can use all of the features that it supports. Simply right-click on one of the Nvidia Telemetry tasks in the Task Scheduler, and select the "disable" option from the context menu. This blocks the tasks from being run. Repeat the process for the two remaining Telemetry tasks, and any other tasks that you spot there that you may not require. The installation of Nvidia drivers on a Windows system adds a telemetry service to the device as well which you may want to disable. Tap on the Windows-key on your keyboard, type services.msc, and hit the Enter-key. This should open the list of installed Services of the local PC. 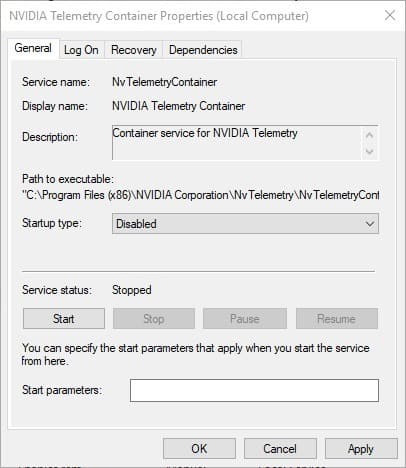 Locate the service Nvidia Telemetry Container, and double-click on it. Click on the stop button to stop the service from running. Select disabled as the startup type. Click ok to complete the process. Note: These tasks may be re-enabled when you update or Nvidia drivers (for instance after completely removing the drivers). 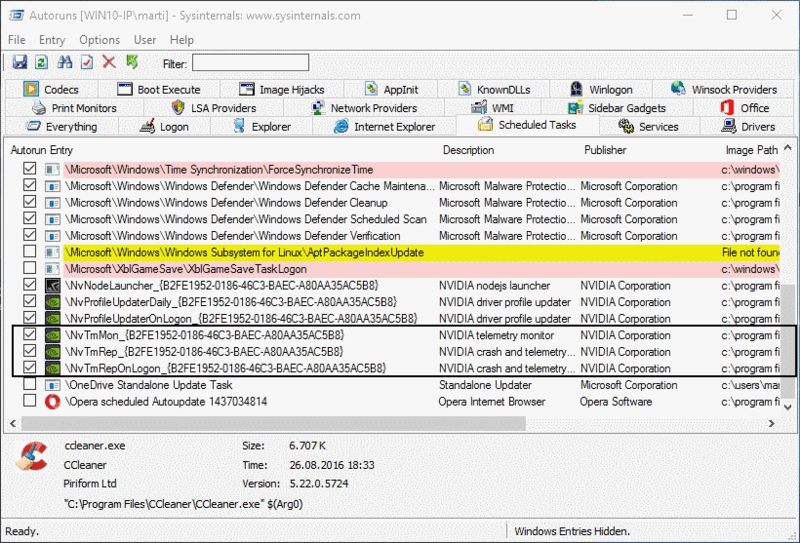 It is suggested therefore to always check the Task Scheduler after Nvidia driver updates to make sure these tasks are not enabled again. Update: A software program has been created that you may use as well to disable Nvidia Telemetry services and tasks on Windows. Now You: How do you handle Telemetry on your system? Find out how to disable Nvidia Telemetry that gets installed with the driver installation on machines running the Microsoft Windows operating system. Always installing only the driver and disabling the “NVIDIA Display Driver Service”, nothing is running in background here. Not found any telemetry task even in “autoruns” and for my part from NVIDIA nothing in Program Files (x86) like the NvNode folder? (NVIDIA driver v342.00 installed). I think this is only part of the latest Nvidia drivers, e.g. 375.70. We sure do call it “la rançon du progès”. Progrès, progrès … et mes mollets c’est du jarret ? (pour rester poli). We were complaining about so-called progress and it’s (inevitable) counter-progress (occasional) issues. From the same anonymous: The NVIDIA v342.00 driver is the very recent latest driver compatible with my machine, coming with security updates I installed last week. I hope the next update will not come with that kind of spyware I can’t uncheck at the installation, scrongneugneu! Thanks Martin, I’ll watch that closely. I have none of the tasks tasks mentioned in the article. I’m running GeForce Driver ver. 359.00 (I chose not to update from there on) and have since always stopped and set to disabled the Nvidia Display Driver service (required only Nvidia’s Control Panel). For the purpose of checking if Nvidia’s tasks were related to Nvidia Display Driver service, I’ve set it to auto and started the service : still no Nvidia tasks. Maybe do these tasks appear with earlier versions of Nvidia drivers only? 9- HOSTS file with HostsMan front-end application, including 8 sources + my own. It is only in 375.70. I had 372.70 before and those tasks were not there. After an install of 375.70 the tasks appeared. And also the license agreement now comes with this text. Customer hereby acknowledges that the SOFTWARE accesses and collects both non-personally identifiable information and personally identifiable information about Customer and CUSTOMER SYSTEM as well as configures CUSTOMER SYSTEM in order to (a) properly optimize CUSTOMER SYSTEM for use with the SOFTWARE, (b) deliver content through the SOFTWARE, (c) improve NVIDIA products and services, and (d) deliver marketing communications. Information collected by the SOFTWARE includes, but is not limited to, CUSTOMER SYSTEM’S (i) hardware configuration and ID, (ii) operating system and driver configuration, (iii) installed games and applications, (iv) games and applications settings, performance, and usage data, and (iv) usage metrics of the SOFTWARE. To the extent that Customer uses the SOFTWARE, Customer hereby consents to all of the foregoing, and represents and warrants that Customer has the right to grant such consent. Thanks for the info. Martin, above, had answered the same to Anonymous but I wrote my comment too quickly without having read him. Another pain in the neck. “Telemetry — read tracking — seems to be everywhere these days. Microsoft pushes it on Windows, and web and software companies use it as well.” states Martin’s article. Indeed. As I see it there’s no possible compromise, no status quo, no gentleman’s agreement between major companies and their users : it is and remains a battle, a combat and perhaps a war. We have to deal with the bad guys’ malware and with several so-called good guys’ privacy issues, tracking to name it, spreading like fleas. I did not get this and I just installed 375.70. So either they removed it already or only some people get this crap installed. Just looked at license.txt file as well and no such text. Now we have to worry about device drivers, too? Incredible… For this reason alone, I could easily choose an AMD card instead in the future. So I looked at the sample… that sure seems a lot of info they are collecting… not everything has to do with graphical and/or pc performance and compatibility. Still what worries me the most is that you have a sample so it’s safe to assume data logging isn’t even encrypted? I installed 375.70 on Win10 x64 and none of that crap was installed so must not be for every install. You can use e.g. 7zip to extract the files, no need to run the installer twice. Damn Nvidia. I’m using an older driver that I had on my HDD because I could not be bothered downloading a newer one last time I installed W7, updating Windows alone is painful enough. I wanted to update it at some point, but now I’m even less determined to do so..
Another good reason, if you needed one, to always choose custom when installing anything and check what’s getting installed and if you need it. I tore out everything from Nvidia driver (s) due to losing my LED monitor signal with it. Various times after starting Windows 10 x64 Pro AU and GTX 950 card. Nothing I could do would stop that. PC would stay live but no signal detected msg and black screen. Finally read the Net and many common msgs about the 900 series doing this. People have redone mobo, power supply, ram, etc. to no help. At first remove using the DU program or in Control Panel would soon see it back again. Disable option worked until Windows would start it up after some upgrade. So fully pulled any signs of it. Ok now. Hence the 3 lines don’t appear in the mentioned library. Don’t think this occurs in the following Series 10 but not sure yet. Thanks for article. Just disabled the 3 you mentioned. piece of cake. will keep an eye on Nvida updates. Relax, NVIDIA’s telemetry didn’t just start spying on you! Of course they are spying on people. Why do you think they keep their driver closed? On my sons Windows 10 PC he had the three tasks, which I disabled. However, this did not stop the service running, and if I ended it, it restarted again. I found that a service was created (set to automatic of course), and disabling that stopped it restarting. Now, I’m running the same version of the drivers as my son, but I’m on Windows 7 x64. I do not have this service or the tasks. The only difference between our installations (Aside from the OS), is that I NEVER install the User Experience bloatware. I wonder if the two are linked? 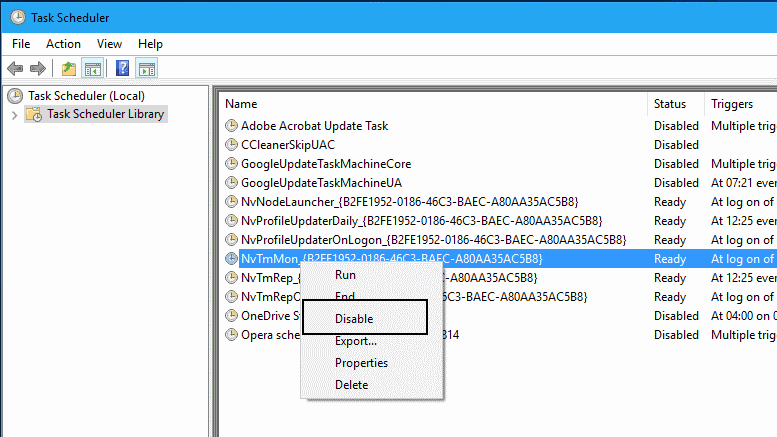 all you need to do is to find telemetry process in task manager, then right-click it and choose open file location. then when your system opens it, just rename the extension of the file from exe to something else like exex so your system will not recognize it as an aplication. then just kill the said process and in will not restart again as system will be unable to find this process or run it. 1 New driver (6 April ) , have separate telemetry service and install wo user permission ! Using process monitor found that nvcontainer has telemetry running in it. Even i have disabled it from shedule and autoruns. How did you collect the sample data set? Are they not using https, or some encrypted protocol? I installed latest GeForce 382.05 Driver two days ago and *only because security issues* had been reported concerning pre-382.05 drivers. I opened Windows Services and noticed indeed the new NVIDIA Telemetry Container (NvTelemetryContainer) service, running and set to autostart. I stopped it and set it to disabled. From there on no Nvidia tasks in the task Scheduler and no Nvidia Telemetry spotted by Autoruns. 1) .exe files can be opened with a program like 7Zip and extracted into a folder. 2) You can then delete the folder labeled NvTelemetry and install the drivers normally by launching Setup.exe in the extracted driver folder without any telemetry whatsoever. This works for now, although Nvidia could become more insidious about it and plant the telemetry files inside the main graphics driver. There may be an easier way. I hate to say it but, let the OS update your Nvidia drivers. * I do mean latest, 388.13, I had been using 388.00 with my 980ti. Oh and Microsoft isn’t the only company doing “telemetry”. Check Google analytics (free) on most all sites and if you have Chrome and logged into Google/Youtube… shut that off (logout unless you need to be logged in). Google can see what sites you are at, what web pages you are viewing and where you’re going to next. These are private companies. will this disable my Shadowplay, instan replay, exc ?? This process has a problem: if I disable telemetry tracking, when I want to open GeForce Experience app, is not launched. I enable telemetry again and GeForce Experience launches without problem. Simple solution: Don’t use GFE.